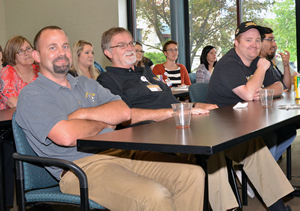 Jason Brandow, (left) the Veterinary Health Center building supervisor, and Nick Gustafson, (in hat) a technician in the Lyons Feline Genetics Laboratory, were recognized during the Staff Recognition Reception as finalists in the Chancellor’s Outstanding Staff Award. MU College of Veterinary Medicine Dean Neil C. Olson presented three 2017 Dean’s Impact Awards on May 23, honoring the contributions of two individuals from within the college and a college alumnus. The annual awards were established in 1993 to recognize individuals for sustained and significant positive impact on College of Veterinary Medicine programs. One to three individuals, usually a staff member, faculty member and individual from outside of the college, are selected for the award. This year’s Impact Award winners were Bruce Whittle, DVM, a member of the CVM Class of 1994, Cheryl Rojas, BS, MT, laboratory supervisor Veterinary Medical Diagnostic Laboratory Clinical Pathology Section, and Frank Booth, PhD, a professor in the Department of Biomedical Sciences. CVM Dean Neil Olson presented a Dean’s Impact Award to Bruce Whittle, DVM. Whittle’s wife, Gayla Whittle, DVM, is also pictured. 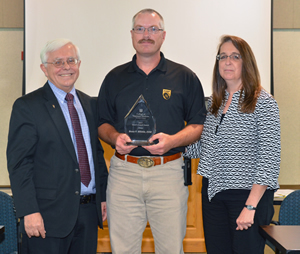 Whittle, a former president of the Missouri Veterinary Medical Association, was recognized for volunteering his time to present dentistry labs to students. 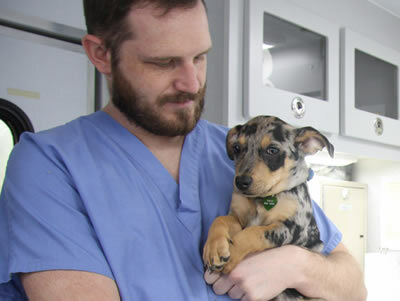 He also helps veterinary students advance their education by mentoring those who shadow him at the rural mixed animal practice he owns and operates with his wife, who is also a veterinarian. Olson noted that Whittle has worked to maintain professional industry standards by involving himself in legislative issues, particularly pertaining to equine dentistry. Rojas has been on the staff of the VMDL Clinical Pathology Section for 21 years and has served as the laboratory supervisor since 2014. 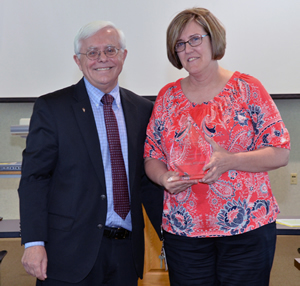 Cheryl Rojas received the Dean’s Impact Award presented to a member of the staff. The section performs more than 20,000 diagnostic tests each year. She was commended for her efforts to ensure a quality minded, efficient and customer service-oriented laboratory. Her efforts were instrumental in the VMDL receiving full accreditation from the American Association of Veterinary Laboratory Diagnosticians, Olson said. Booth has been on the CVM faculty since 1999. He is considered a pioneer in the field of molecular exercise physiology, whose research has been funded by the National Institutes of Health, the National Aeronautics and Space Administration and the American Heart Association. 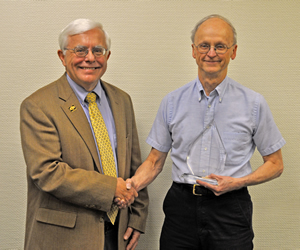 Dean Olson congratulates Frank Booth, PhD, on his Impact Award presented to member of the CVM faculty. He has earned the highest awards in the field from the American Physiological Society and the American College of Sports Medicine, published more than 79 review articles on exercise and physiology, and has influenced the direction of the field of physical inactivity and its link to chronic disease. He has served as the advisor to 24 doctoral and 23 postdoctoral trainees. He also made a gift of more than $1 million to MU to fund research into physical activity and health. Tyler Roberts, 5 years, Tracey Berry, 10 years, Emi Meyer, 10 years, Cynthia Richards, 15 years, Rose Leykamp, 20 years. Alexander Meuth, 5 years, Jianping Chen, 20 years. Nicholas Bartlett, 5 years, Brett Jones, 5 years, Benjamin Landers, 5 years, Justin Thomas, 5 years, Jesse Bowman, 10 years, Candace Kassel, 15 years, Nathaniel Kling, 15 years, Jami Davidson, 20 years. Deanna Biondo Bell, 5 years, Catherine Harmon, 5 years, Abby Hawkman, 5 years, Sylvia Hohmeier, 5 years, Michael Perkins, 5 years, Ruth Silverberg, 5 years, Gaye Sponamore, 5 years, Janiene Dey, 10 years, Stephanie Gilliam, 10 years, Kelly Michael, 10 years, Matthew Haight, 25 years, Michelle Lancaster, 30 years. Joseph Waterman, 5 years, Tendai Mutangadura, 15 years.